Follow the instructions: use the washable marker and trace with it a hand print. Use the paint brush and fill up the traced hand with glitter glue. take the glitter (in whichever color (s)) you want to and shake it over a paper plate funnel on the ornament. Start filling the remaining areas using glue and shake different glitter colors and your project will be done! You will need the following materials: black and orange sharpie, sponge brush, egg carton (comes in handy in the drying phase), round ornaments (clear rounded plastic or glass), white acrylic crafts paint. Follow the instructions: start by painting one hand. Place the ornament on the painted palm and hold it in position for three to five seconds. Leave the ornament on the egg tray to dry for around ten to fifteen minutes. Add the snow man details. Add the year at the bottom of the ornament. Decorate the snow man on every finger print. Allow the balloon to dry. Add a ribbon and hang it on the tree. Repeat this process for all your ornaments. You will need the following materials: heat gun, glass ornament ball in any color, q-tip, embossing ink, embossing powder. Follow the instructions: When your baby is in a happy mood or sleeping off, apply the embossing ink on both hands. Place the hands on the ball and hold it into position for three to five seconds. Place the ball on an egg tray and allow it to dry for five to ten minutes. As it dries off, use the Q-tip to clean up the messy bits. Sprinkle the embossing powder inside the hands on the ornament. Write his, her name at the bottom of the ornament. Use the heat gun to seal it into position. You will need the following materials: red ribbon, card stock paper, hole punch, bobbly eyes, glue-non toxic, red, pink or black pom, pom’s for the nose, colored pipe cleaners and a host of other embellishments for the ornaments. Follow the instructions: Lay down a few newspaper pages on the working area. Paint the foot of your child with the brown paint. Place the foot on either a cardboard or a piece of paper. Set the print under light to dry off for at-least an hour or an hour and a half. Once it dries up, place the heel up wards and stick a red nose and some eyes on it. Paint your child’s hands brown. Follow the same procedure that you used on the foot print and place your set of hands on top of the reindeer head and form the antlers. Add a bow and several other adornments and your reindeer is ready to go on the tree or wherever it is supposed to! You will need the following materials (dough): half a cup of water, half a cup of salt, a full cup of flour, a rolling pin, straw to be used on the ribbon hole, cookie sheet, offset spatula, an instrument to cut a hand print size circle such as a cookie cutter. You will need the following materials (ornament finish): twine or ribbon, paintbrush, clear mod podge, acrylic paint that is water based and non-toxic, wipes to clean up messes and sticky fingers. Follow the instructions: make the dough. If it is still a bit moist add a little flour until it becomes consistent and forms a big nice clump. Flour a spot on your kitchen counter and roll out the dough until it’s around ¼ inch thick. Use the cutter to cut out circles. Use the straw to push through small/sizeable holes that you will fit through your string/ribbon later on. Wiggle the straw a bit and make a sizeable hole that will not grow smaller after making the string hole a bit too small when you throw the dough in the oven. Pick your child’s tiny hand and hand press it on the dough. Hand press just hard enough (Not too hard, neither too soft) to leave behind a small print. Lay the ornaments on the cookie sheet. Use an offset spatula to lift up the ornaments. Preheat oven to 250F. Bake the imprinted dough for 2-2 ½ hours. Remove the dough with the ornaments from the oven and allow them to cool and harden up. 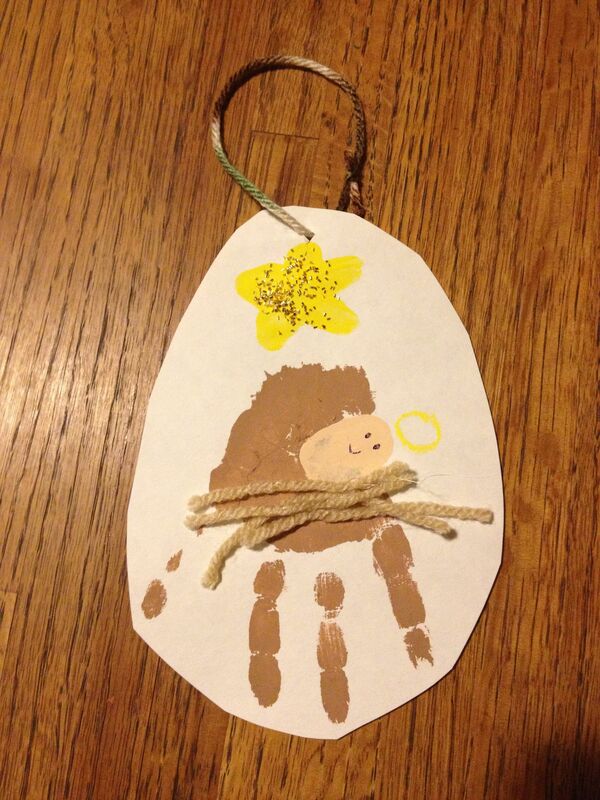 Paint your little one’s hand using a paint brush and gently stamp the hand on the ornament near the handprint. 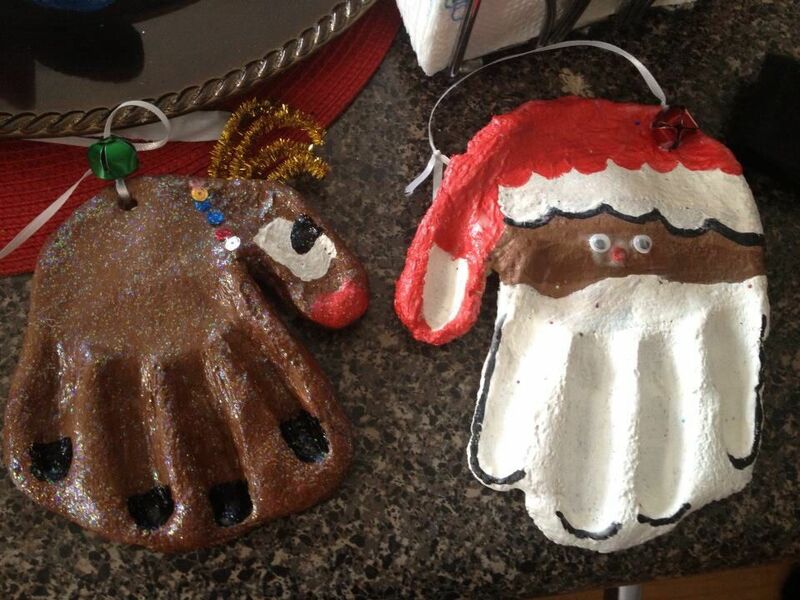 Cover the ornaments using two coats of Mod Podge and allow them to dry up. Use the twine or ribbon to string the ornaments and you can hang this glorious project on tree! You will need the following materials: card stock or brown craft foam, pencil, black marker, glitter glue, ornaments, brown pipe cleaner. Follow the instructions: Start by tracing your child’s hand using a pencil on a card stock or on a brown craft foam. Cut the shape out and on the finger tips add black marker hooves. Add on the project red glitter collar using bells made from gold sequin. Glue on a red pom, pom nose and a goggly eye, and finish off with a tail that you have curved from the card stock or brown craft foam. For the antlers, cut the brown pipe cleaner in half. Bend each of the two halves in two off-center and make sure that you curl the ends. Use glue to glue together the pipe cleaner pieces. Hold the pieces in place using clothespin or paper clip till the glue dries up. Finish the project by gluing the antlers in place on the reindeer. Follow the instructions: Start by painting little wooden balls as well as the stars. After they dry, use a black ball point pen to drawn on closed eyes. Use fabric scraps to make swaddling clothes, glue the head on the inside so that it resembles baby Jesus. On the wreath glue on the hay. The baby doll should be glued on top. Drill holes in the stars. Use a wire to attach the star. Finally attach a ribbon and allow the wreathe to hang on the tree. You will need the following materials: a cup of salt, a cup of flour, half a cup of water. Follow the instructions: Start by measuring, stirring and finally mixing all the ingredients together. If the flour is too sticky add a bit of flour. Flat and roll the dough in a ball using a rolling pin to make sure that it is evenly distributed. Use a pear-lised acrylic paint to attach ribbon hangers at the product’s back using UHU glue. Use a straw to push in a hole through before throwing the dough in the oven. Thread some raffia or ribbon on the final baked product. Vanish it, date them at the back. Leave them to dry out for two days and hang them up! You will need the following materials: dark blue paper, scissors, paint brush, glue, white paint, glitter. Follow the instructions: start by painting your little one’s hand with the white paint. Press the hand on the dark blue paper. Brush on glue on the paint. Add glitter on the painting when still wet. Create a circle from the whit construction and color. Use tissue paper to add yarn or hair. Use the glue and glitter to make halo, leave it to dry for an hour. Hang your Angel! You will need the following materials: green card stock, red acrylic paint, paint brush. Follow the instructions: On the green card stock, start by painting red acrylic paint on the thumb and pass it across the top of your palm. Paint a flesh tone paint on your hand and paint white paint on the four fingers. Place the painted hand on the paper. After the print dries up, dip the finger in white paint and use it to make Santa’s moustache. A few prints across the hat’s bottom and another print at the end of the hat. Light red or dark red print should be used for Santa’s nose. Two fingers print eyes either in blue or grey. When it dries up, cut up Santa print out. Punch a tiny hole for the ribbon, add the date and name, place a picture on its back and hang him up. You will need the following materials: packing paper, brown acrylic paint. glitter. Follow the instructions: Start with the packing paper right from the Dollar Tree. Paint your hands from dad to little baby using the brown acrylic paint. Place your hands on the brown paper. Add glue on top of the wet paint, throw in some glitter. Add the names under each hand print. Add the date, month and year,. Leave the project to dry. Frame it and hag it. You will need the following materials: white paint, green card stock, glitter, glue. Follow the instructions: either dip or paint your child’s hand in the white paint and press the hand on the green card stock and allow it to dry. For the scarf and hats, use the acrylic paint and a small paint brush. Use the orange paint on each carrot nose. For the mouth and eyes, use a fine point sharpie marker, blue bow, green hearts and gel pens on white arms. Leave them to dry and punch a snowflake on your hand, add another snow flake. Cut green paper round the hand. Use red card stock. Cut into hand shape and proceed to add white card stock cut it into the shape of the hand. Punch small holes and add a ribbon to hang the ornament and date it front and back and add a picture at the back. Enjoy!! !